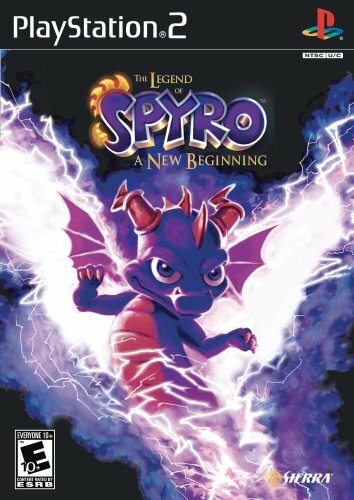 In The Legend of Spyro: A New Beginning, Spyro embarks on an action-packed adventure that redefines his history. Players will experience the awesome power of the purple dragon as they unleash devastating fury attacks, Upgradeable breaths and ground-to-aerial melee combos in frenzied battles with hordes of menacing enemies and bone-chilling bosses. I've been playing the Spyro games for a long time, ever since the first game (Spyro The Dragon) was released for Playstation. After playing the trilogy while growing up on the Playstation One, I than awaited for Insomniac to make some new Spyro Gems for the Playstation Two. How disturbing this series has become since than. Spyro: Enter the Dragonfly and Spyro: A Hero's Tail were alright, although the first one of this whole new series did have a bunch of clich¨¦s, and the second one was frustrating, this game is a failure. What have they done to you Spyro? Now you are "Spyro Baggins," going off on your new little quest, which is totally wrong. They re-ripped, re-burned the old, awesome little spit of flame from the original series and made this cheap-skate to earn some cash. Spyro is now a disturbing little dragon and sparks is absolutely stupid. Why are they trying to input famous voice-actors into this game? Its not working. A while back, after playing this game I got rid of it. For anybody who is new to Spyro, trust me, don't play this game, or the one after this (Eternal Night). Rather try to find a copy of the first game, Spyro The Dragon, and play it. I have played Spyro since the beginning. I have been a huge fan of the concept and the way the versions have improved over the years. The latest chapter in the Spyro series has some cool new moves and the famous voices make it a bit more interesting. However, that's all that I liked about this Spyro. You spend a good portion of the game in training, with no choice of continuing the game without finishing it. The worlds seem to be less '3-D' due to the fact that you are forced down one path and one path only. Finally, it took only a couple of days to finish the whole game - I want something that lasts longer. I was a bit nervous when I bought this game, mainly because it's a new Spyro series. Here's what I thought about the game itself. Good: -Deeper storyline than the old Spyro games. -Sparx speaks normally like he was supposed to. -Potential in the video game market. Bad: -Spyro's charging is difficult to control. -The start of this game is a bit slow and only 30 minutes into the game, it catches up. -You can't skip any cutscenes, but you get used to it. Those Dumb metiors keep on comming and they totally kill you. I also agree with you about Tall Plains The best level of the game! You Know what's even cool I beat Cynder everytime I play the game! The voices of Elijah Woods and David Spade couldn't be more annoying- is there a reason after all the spyro games they felt the need to give them voices? A great buy for any Spyro fan!